The BIOSTAT® B is our universal benchtop controller for stirred and rocking motion systems. Designed to meet your specific needs, BIOSTAT® B covers a wide range of applications, extending from use as a flexible basic unit for preclinical research to a fully qualified system that complies with the requirements of a validated GMP environment. You can use our BIOSTAT® B for animal, plant and insect cell cultivation as well as for microbial fermentation. All inlets and ports for, e.g. cooling water, process gasses, electricity, ethernet and potential-free alarm contact are located on the rear panel of the control tower. An equipotential bonding conductor shields the bioreactor against electromagnetic current and ensures interference-free measurement during your processes. Quick-connect couplings make it easy to attach all cables and supplies to the culture vessels. All connections are clearly marked with the same names used on the rear control tower panel and in the local control software menu for fast, error proof identification. The control tower contains both the aeration, pump and temperature control modules, saving valuable bench space in your lab. Protected against water splashes and dust deposits. Easy-to-use and reliable operation – even while wearing laboratory gloves. The storage dish creates space for depositing accessories and is easy to remove thanks to its secure magnetic attachment. Our proven autoclavable borosilicate glass culture vessel is available in four different volumes: 1 L, 2 L, 5 L and 10 L for all kinds of cell culture and microbial applications. Our single-use 2 L stirred-tank vessel for cell culture applications combines scalable design with all the benefits of disposable solutions. No more worries about challenging timelines, workload or cross-contamination. Get started within minutes. Our proven wave-mixed bioreactor consists of a rocker unit with bag holder and pillow-shaped Flexsafe® RM single-use bags for culture volumes from 100 mL to 25 L. Use it as basic system or in combination with the BIOSTAT® B control tower and single-use optical pH and DO sensors to enable advanced control strategies for batch, fed-batch and continuous perfusion. Design your process strategy or select different options. Configure your BIOSTAT® B with gravimetric feed control, gravimetric level control or substrate addition profiles. This enables you to run your BIOSTAT® B in batch, fed-batch, continuous or perfusion mode. 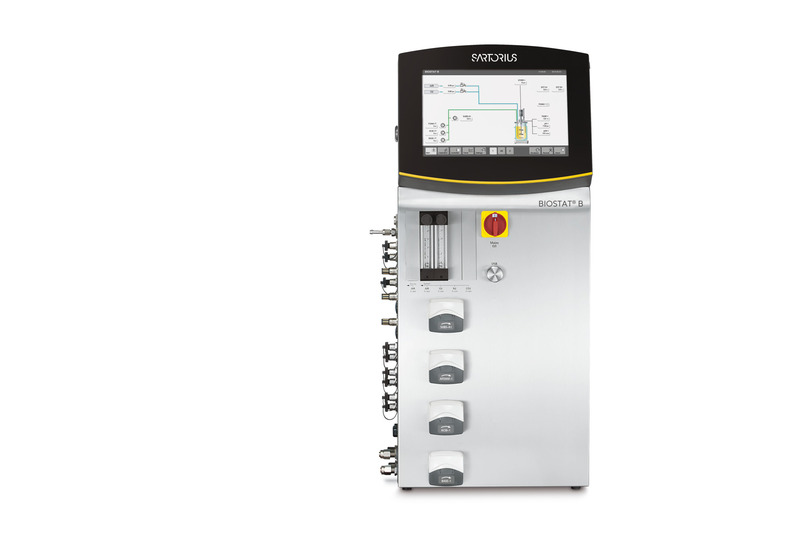 Besides classic DO cascade control, we have developed the unique advanced DO controller that gives you more flexibility to develop and optimize your DO control strategy.The advanced DO controller supports parallel adjustment of all DO affecting parameter settings like stirrer speed and gas flow rates of air and pure oxygen, automatically and simultaneously to control the DO set point. Optionally, you can keep the total gas flow rate constant and the ratio of pure oxygen in the gas mixture is increased automatically to match the oxygen consumption of the culture. This gives you ultimate flexibility to adapt your aeration strategy to your process requirements.